TROJAN FOOTBALL: "It's Only About Us"
Fall Camp opened this morning, a day after USA Today listed its preseason Top 25. As it turns out, the No. 4 Trojans will face four of the preseason Top 25 on the road. No easy task to be sure. 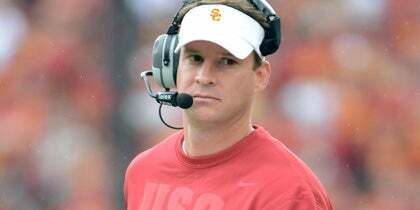 However, there is one person who has never cared which opponent the Trojans would play or where they would play them: USC head Coach Pete Carroll. So, in preparation for the opening of Fall Camp, Carroll addressed the question of a tough schedule in which the Trojans must face four strong teams on the road. "I don't care one bit about that stuff," Carroll told his players, "because that has nothing to do with us winning. It's not about whether we play all ranked teams, whether we play in the Midwest, up North, in the rain, in the snow or what jerseys the other team is wearing. It is always about us, and it is always about what we can control. That is all we're concerned with," he admonished. "It's only about us and how we take care of our business right here." For many observers and fans that first order of business is the offense and the competition for the quarterback spot. At least that is the most highlighted, the most glamorous, if you will. While there will be competition at quarterback, I do not believe it will be for the No. 1 spot. I believe that spot is Aaron Corp’s to lose not win. The real competition will be for the No. 2 spot. Although I say the starting quarterback position is Corp’s to lose, I do not mean that Fall Camp and the upcoming games are meaningless as far as that No. 1 spot is concerned. I certainly don’t mean that, no matter what, Corp is the best quarterback on the roster. He is not. Matt Barkley is the most gifted as far as size and raw talent are concerned, but Corp has been the most efficient. He threw only one interception all during the four weeks of spring practice. If he can continue that trend throughout Fall Camp, Carroll will undoubtedly stick with him regardless of how many long bombs Barkley completes. "Our philosophy of football is: it's all about the ball," Carroll stressed right from the outset. "No matter what it takes on offense, you're going to protect this ball. And on defense, there's no play where we're not trying to get the ball away." With that in mind, there is only the one glaring vacancy to fill on offense from a year ago, the starting quarterback spot. On defense there are eight positions where seniors moved on to the NFL. With the front four for the most part and, to a greater extent, the linebackers being untested, Carroll needs a quarterback who can compliment the defense. That means that the quarterback who shows the least tendancy of turning the ball over will get the job. Right now that person is Aaron Corp. Of all the quarterbacks, he is far ahead when it comes to reading the defense and being smart with the ball. In addition, he knows how to use his legs if all his receivers are covered. Barkley, on the other hand, has much catching up to do in these two areas. Even though he has a powerful arm that is definitely Divison One ready (if not NFL ready), I do not believe he will be able to gain on Corp when it comes to protecting the ball. However, I also cannot believe that Barkley will be redshirted. As Fall Camp opens, he is far ahead of the No. 3 quarterback Mitch Mustain in all areas of the game, including enthsiasm and leadership. Unless Mustain forgoes his "lay back" attitude and shows the coaching staff some determination and leadership as well as improved quarterbacking skills, I expect Barkley to remain in the No. 2 spot. Tomorrow, I would like to give my thoughts on the rest of the Trojans offense and how it will look going into the 2009 season.